Yesterday, I met with a cancer coach at the survivorship centre. My stated goal was to improve my health and prognosis by eating well and exercising more consistently. I shouldn't have been surprised that I was matched with a nutritionist but I groaned inwardly when my coach filled me in on her background. Two years ago, I met with a nutritionist weekly for nearly a year and I learned a few things but mostly I paid a lot of money to feel bad about myself. Someone else might have really liked the woman I worked with but I found her judgmental (for example, not only did she not drink alcohol, she could not understand anyone who did, even a little) and extreme (her idea of a treat was to have one square of very dark chocolate, once a week). Under her smug judgmental gaze, I felt like a complete failure. The implicit message was that if you can't do it all, you might as well not try (that may not have been her message but it was how I felt). I stopped seeing her, feeling that I'd accomplished very little. The cancer coach I met with yesterday was very moderate in her approach. She actually said, "everything in moderation, including moderation." After she'd told me about the centre and the programs available to me, we talked about food and eating and self-care for more than an hour. I left with information and a feeling happy and good about myself. I see her again in two weeks. We're just back from a restorative week in Florida. It was truly wonderful to be with loved ones, play outside in the sun and dispense with all cold weather gear. We arrived home at 2:30 in the morning to the snow and the cold. I'm sleep deprived and I don't wish to leave my house. But in a few short weeks, winter will be behind us and I can put my winter gear in storage (or just leave it out and in the way until I need it again). I feel very, very lucky to have escaped, even if I could use a nap this morning. This afternoon, I have an appointment at Ottawa's "survivorship centre" with a "cancer coach". The place has been open for less than a year and offers a host of programs for people in treatment. I went to an orientation session a couple of weeks ago. I was impressed and inspired by what I saw there. The Maplesoft Centre (the name bothers me for it's lack of descriptiveness and for other reasons, too. I started to explain and then realized I was writing so much in these parentheses, I need to save my comments for another post) is a beautiful building with a family room, sitting room for meetings, full kitchen and kitchenette, an exercise room, an infrared sauna and something called a Snoezelen room that really has to be seen to be believed. They offer a host of programs related to all aspects of physical and emotional health (nutrition, exercise are chief among them but I helped pilot the Arts for Wellness program last spring) . Some programs are drop-in and some are ongoing. All are free to cancer patients, after an initial session with a cancer coach, who helps to set goals. Participants can choose to meet with the coach twice more or simply to avail themselves of whatever programs and services appeal to them. The centre staff are the first to admit they were initially afflicted by growing pains. I signed up while I was participating in the Arts for Wellness pilot, that was then taking place off-site. The following summer, I rode my bike to the centre and was put off by how deserted it was and the way the admin staff seemed to have no idea what to do with a visitor. I was definitely left with the impression that the place (which houses the Ottawa Regional Cancer Foundation) was there for fundraising and not really available to cancer patients. I'm happy to admit that I was wrong. While I did fall through the cracks (I should have received a call after I joined, inviting me to an orientation and a meeting with a cancer coach), my experience appears to be an anomaly. The place I visited three weeks ago was a hive of activity, full of men and women of all ages. Even the lounge area, which they'd had to unlock on my earlier visit, was busy with people reading, working on their laptops or using the computer made available to members. The centre still takes three times as long to reach by public transit than it would by car (but that's the City of Ottawa's fault) and it only has a handful of bike racks ( perhaps we can remedy that in the warmer months) but parking is free and there is a bus stop right outside the centre. I think the Maplesoft Centre needs to be doing better outreach to potential members. They also need a "how to get involved" tab on their website. As internet savvy as I am, I could not find anything explaining how to get involved. If the orientation and cancer coaching sessions are a requirement (and I can appreciate why they should be) then this information needs to be readily available to potential participants. I certainly would have been keener to make use of the centre if I had known this information. My appointment is this afternoon. I'm looking forward to it. Watch this space to see how it goes. Now that the swelling has gone down, I have come to realize that there is a sizeable dent in the back of my head. I'm not sure if it's visible but I can certainly feel it.like - a chunk of the back of my head was scooped out with a melon baller. I find this both distressing and fascinating. I spend a lot of time feeling the dent and comparing the two sides. It's all I can do not to ask everyone, "Want to feel the back of my head?" This is probably another good reason to grow my hair out. It's one thing to have a scar that goes from my nape to above my ear. The dented bit just adds to the impression that I might be related to Frankenstein's monster. I feel pretty normal for someone who is missing a bit of her head. The missing piece can't have been to important. And seriously, if you know me in real life, it's totally OK to ask me about it. I'll even let you feel it. 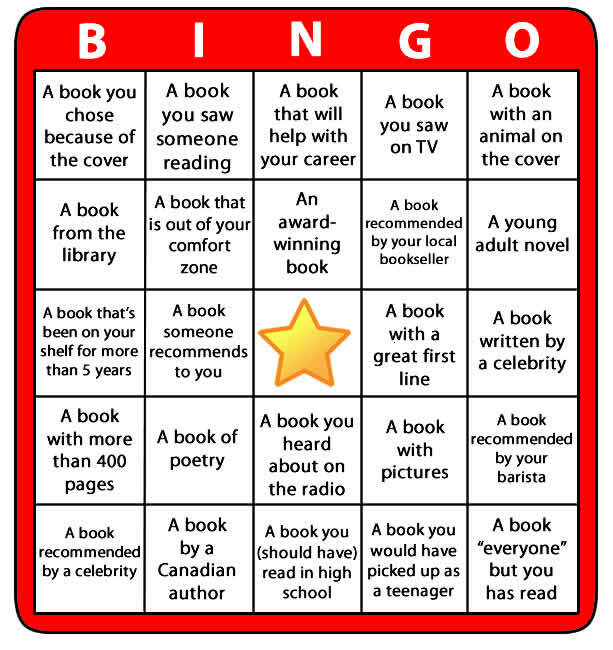 Want to join in a reading challenge? I've posted details over at Frivolity. 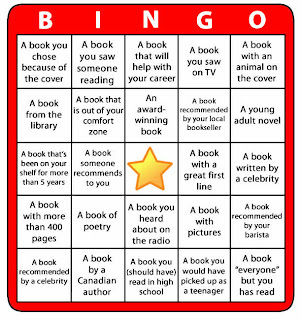 This year, I'm playing Reading Bingo! As I mentioned in my last post, I had an MRI last Sunday. I have subsequently had a really trying week (changing appointment times, having to negotiate and fix many bureaucratic issues with staff who don't know me, treatment and two dentist visits, culminating in a spectacularly messy and traumatic root canal) but I've a phone call from my oncologist that put it all in perspective. Dr. G: "Guess what your MRI showed?" Me: "Well, you probably wouldn't have put it like that if it had showed anything bad...So...It didn't show anything?" Dr. G (sounding jubilant): "Nothing! No active disease, no residual disease just the effects of surgery." Me: "So my brain is like my liver now. It looks like it's been through the wars but otherwise it's just fine?" I feel far more relieved and happy about this than I did when I had the CT. Not that I take the situation with Herceptin for granted but I do know that it has worked for me for more than 6 years. My brain, on the other hand, remains unprotected. From now on, I'll be experiencing every clean MRI as a gift. Bring on the root canals. I almost feel like myself again. And it took surgery to remind that feeling like myself is not bad at all. My head still hurts but I can live with that, knowing that it's likely temporary. I can't bring myself to get a hair cut (combing my hair really hurts), so I've decided that I'm growing it out. It looks pretty bad much of the time but I can live with that, too. The best part is the return of my energy. I can do things again, around the house and out in the world. Last week I went swimming, to an exercise class at the Cancer Foundation, to two yoga classes (one restorative and one yin, so not too taxing) and I walked lots. That feels really good. I'm also cooking more and taking my Weight Watchers membership seriously. I think it's all about exerting some control over the things I can. As for the things I can't control, I'm trying not to think too much about that. I had an MRI yesterday morning (8:20 on a Sunday morning seems very humane when you're also offered 7:00am on a Saturday. And I have friends who've had MRIs during the wee hours). I don't know who will give me results (the surgeon who ordered the test is notoriously hard to get in to see), how I'll get them or when they'll be ready but I'm working hard at figuring that out. The odds are that all is well and that I can forget again (or at least try) for another couple of months.